Note: Conventional-fueled vehicles only: gasoline, diesel, mild hybrids. Light-duty vehicles are generally classified into two groups: passenger cars and light trucks. However, crossover utility vehicles (CUVs)—which appear similar to sport utility vehicles but share design attributes with passenger cars—are blurring the distinction between the two classifications. The light truck category includes pickup trucks, minivans, sport-utility vehicles, and all other light-duty vehicles that are not classified as passenger cars. Because light trucks have less stringent fuel economy standards and generally consume more fuel than passenger cars to travel equivalent distances, the increase in the sales share of light trucks has long-term effects for vehicle fuel consumption. For both passenger cars and light trucks, fuel economy standards are determined based on vehicle footprint, the area of the rectangle defined by the points of contact between the four wheels and the ground. 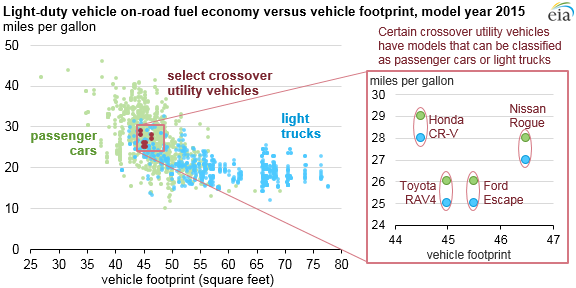 Analyses of vehicle sales and fuel economy trends are becoming more complicated by the increasing adoption of CUVs, which are constructed like passenger cars, have similarly-sized footprints, and often use the same small, fuel-efficient engines. The share of the total light-duty vehicle market attributed to CUVs reached 32% in 2016 according to Wards Automotive, an automotive analysis group. The light trucks with larger vehicle footprints and lower fuel economy tend to be pick-up trucks, such as the Ford F-150, or SUVs, such as the Chevrolet Tahoe. All else equal, the growing share of CUVs counted as light trucks tends to raise the overall sales-weighted average of light trucks sold. In considering the effects of increased CUV popularity on fuel economy calculations, it is also important to recognize that CUVs are classified in multiple ways by different government agencies and industry sources. For example, the Bureau of Economic Analysis (BEA) within the Department of Commerce and some industry sources classify vehicles on the basis of gross vehicle weight limits, vehicle appearance, and other criteria. In BEA's data, all CUVs are counted as light trucks. When implementing fuel economy standards, however, the National Highway Traffic Safety Administration (NHTSA) and the Environmental Protection Agency (EPA) categorize CUVs as either passenger cars or light trucks depending on their characteristics and features. For instance, one of the best-selling CUV models is the Honda CR-V. The two-wheel drive CR-V qualifies as a passenger car, and the all-wheel drive CR-V qualifies as a light truck. Other popular models that can be classified as a passenger car or light truck depending on how they are optioned include the Toyota RAV4, Nissan Rogue, and Ford Escape. For these vehicles, the differentiating factor is whether the vehicle has front-wheel drive or all-wheel drive. Some other CUVs and vehicle model types may also be classified as passenger cars by EPA and NHTSA depending on other criteria. The classification of some CUVs as passenger cars by NHTSA results in the application of more stringent fuel economy standards to those vehicles despite being classified as light trucks by some other sources. This application of fuel economy standards, as well as the higher fuel economy of CUVs classified as light trucks by NHTSA compared with other types of light trucks, tends to moderate the fuel economy and energy consumption implications of increases in the popularity of CUVs.